A crowd gathered for testimony on the physician- assisted suicide bill at the state Capitol yesterday. After an emotional six-hour hearing with more than 1,000 people submitting testimony, lawmakers have apparently killed a controversial physician-assisted suicide bill, at least for now. 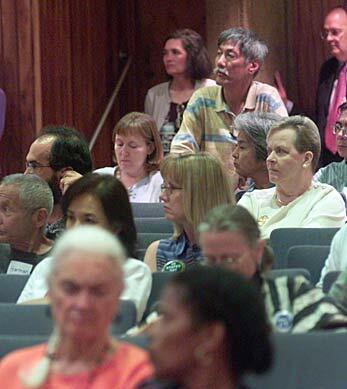 "I don't think it's going to go away," said House Health Committee Chairman Rep. Dennis Arakaki (D, Alewa Heights-Fort Shafter), after his committee voted to defer the bill. "At this point, the sentiment is against it." The measure could be reconsidered next Legislative session, but Arakaki said lawmakers have not expressed much interest in making it a priority. Only Oregon has a physician-assisted suicide law, which allows doctors to prescribe life-ending drugs to the terminally ill.
Arakaki said the Legislature needs to look at other health care issues for the terminally ill and the 85-plus population, including improving hospice care. "Unless we're able to assure quality of life," he said, "I think there's going to be more and more pressure to look at this alternative." Hawaii lawmakers have been grappling with the issue since 1999, when the first physician-assisted suicide bill was introduced. Three years later, a similar measure that passed through the House was narrowly defeated in the Senate. Supporters of the bill say physician-assisted suicide would end unnecessary suffering for the terminally ill.
"This is primarily a matter of personal choice," Rev. John Heidel, a former chaplain at Punahou School, told the House committee yesterday. "We should have the freedom to make our end-of-life choice. ... We should live with dignity and we should be allowed to die with dignity." Debbie Shimizu, executive director of the National Association of Social Workers' Hawaii chapter, agreed. She told lawmakers yesterday that choice should "be intrinsic to all aspects of life and death." But opponents of the bill say drug management advances in the last few years have allowed terminally ill patients to die relatively painlessly. They also say the bill would raise serious ethical questions for doctors. "Legalizing physician-assisted suicide, the whole essence of society and the medical profession would change," said Chris Niemczyk, who suffers form cerebral palsy. "It is ultimately the state making the decision on which groups can live or die, setting a dangerous precedent." Dr. William Petty, an oncologist and one of several Oregon physicians who flew in for the hearing to voice their opposition, said those facing death "are potential victims of subtle and not-so-subtle coercion." "Care and treatment can be expensive," he added. "Manipulation of patients is a real problem when physician-assisted suicide becomes an option." Nearly 500 crammed into an auditorium at the Capitol for the health committee's hearing, and emotions ran high as attendees talked about whether "death with dignity" includes suicide. As the day wore on, the crowd thinned. But about three dozen -- including supporters and opponents of the bill -- stayed for the entire meeting, giving different speakers quiet applause or sighs of disagreement.